It’s a game of runs. And boy did the Roughnecks ride a run to victory. Four straight goals late in the game were enough to thrust the visiting Riggers to a 12-9 victory over the Rochester Knighthawks at Blue Cross Arena. “It’s massive,” said coach Curt Malawsky of his team’s late-game rally. Curtis Dickson was exceptional on this night, recording 5 goals and 4 assists, a game-high. Dane Dobbie (3g, 3a), Dan Taylor (1g, 1a), Tyson Bell (1g, 1a), and Zach Currier (1g, 1a) were also heavily involved in the Riggers offence. While the offence was strong all game long, it was the performance of Christian Del Bianco between the pipes that made the difference. The fourth-year goaltender was the backbone of the defence, making 48 saves on 57 shots in the contest. “When they had chances in our end, I thought Christian was absolutely outstanding and he made massive saves when we needed him,” said Malawsky. The Rigger’s bench boss was just as thrilled with the play of his entire unit in front of his backstop. “We came in at the half down 7-6 and they had three powerplay goals, three transition goals and only one five-on-five,” explained Malawsky. “We just figured we’d make some adjustments and build off of that. They got one off of the face-off and one more on the powerplay, so that’s pretty good team defence for us. Calgary and Rochester traded goals back and forth for most of the first half, with Kyle Jackson (3g, 1a) grabbing the final two of the second quarter to put the Knighthawks up by one heading into halftime. Luc Magnan (1g) started the second half with a bang as he buried a goal 13 seconds into the third quarter. Calgary would score the next four goals, with two coming from each of Dobbie and Dickson. The Riggers then added a few more to leave Rochester with a much needed win. 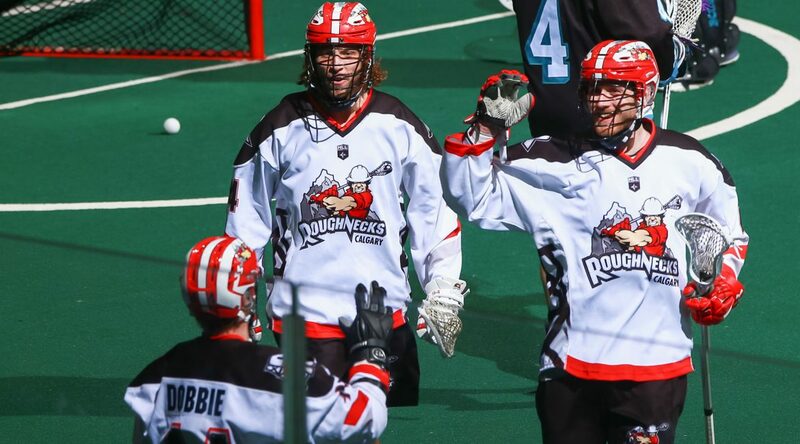 The Roughnecks will return home next weekend for a divisional match-up against the San Diego Seals at the Scotiabank Saddledome (7 p.m.).